3-storey antique shop where is sold the lords of Japanese and European antiques, such as lighting equipment, goods and more At first, you would be surprised that the amount of the antiques are displayed everywhere like there is no place to stand in. Main items are at the early 1900 period Japanese western style furniture and precious rare merchandise which might not be sold other shops. It is worth spending your time one day at least. Dimly light lamps would take you past before your time. Try to browsing the items while listening to the sound of a retro wall clock. Take your time to find something special lovely. Japanese traditional bowl dishes are really recommended. Why don't you buy some as one of the interior of your house? This is a grand piano which used to played when the shop was a Jazz Kissa (Cafe). 3 brilliant grand pianos were played at that time. Try to Imagine the person who used to plays the piano! It is priceless, so we recommend to take a photo of it. At times, the repair man clean and repair in front of the shop. Please look carefully at how to repair! It is so interesting! ・Annual summer sale in 2016 ・July 2 (Sat) - 24 (Sun) ・Almost all items are discounted ・50% off for lacquer ware in 3rd floor ! This is an antique store close to Heian Jingu Shrine. Three floors packed full of antiques, this place makes me excited just looking at all of them! 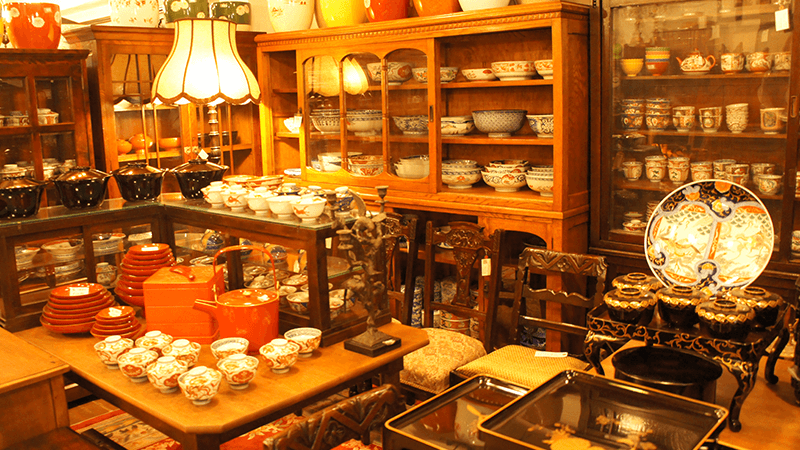 They have western and Japanese antiques, and you may find treasures here. If you go to Heian Jingu Shrine, remember to also stop here! 10-minute walk from Keihan Line Jingu-marutamachi Stn. A staff of the shop speaks English.